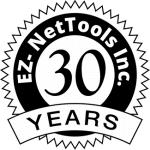 The EZ-NetTools Website Builder is an easy to use system that provides those who don’t want to understand all of the ins and outs of website building with a chance to get their business online at affordable prices. These templates will help you get started with your website. This product is where we get our name from!